In England and Wales, the staple food, before potatoes became commonplace in the seventeenth century, was bread, which might be made from wheat, barley or rye. The quality of bread eaten varied according to rank. The very wealthy ate fine, milled white bread, known as “wastel”. 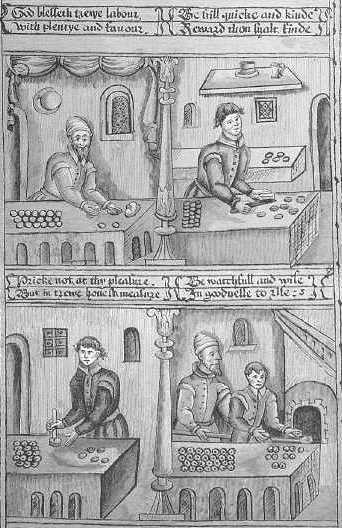 For the very rich, there were also “manchets” which were small loaves, about the size of a hand, and often sweetened. The lower down the social scale, the coarser the bread, with peasants consuming the heavy, dark, grainy breads, that to the modern palate are the more sophisticated. There were at least seven grades of bread, down to the lowest “clap-bread” made of barley or oats. For the poorest members of society, bread would never be wasted – every scrap would be eaten, either as a meal in itself, or as an accompaniment to pottage. Moving up the social scale, stale bread was used as a “trencher” or plate for other foods. Each diner would cut his own trencher from the loaf, taking care not to break it. The trencher was cut thick enough for a hollow to be made in the centre. The diner would then help himself to the various dishes, taking care not to spill, or to leave his spoon in the bowl, and lay the food on the trencher. He put his salt on a small trencher to the side, it being the height of bad manners to stick your greasy knife back into the communal salt dish. At the end of the meal, depending on the status of the household and the relative scarcity of food, the trencher might be eaten by the diner or given with the other “broken meats” as alms. 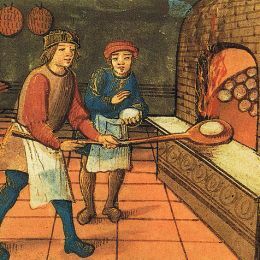 In many places, the poorer households did not have a bread oven, so the housewife would either take her proven dough to the baker for cooking in the communal oven for which she would pay a fee, or buy a finished loaf from the baker. In Scotland, matters were rather different. The climate did not lend itself to the cultivation of early wheat varieties, being more suited to oats and barley. Oats were generally used to make bannock – a round, flattish loaf, which could be cut into wedges, often called scones. 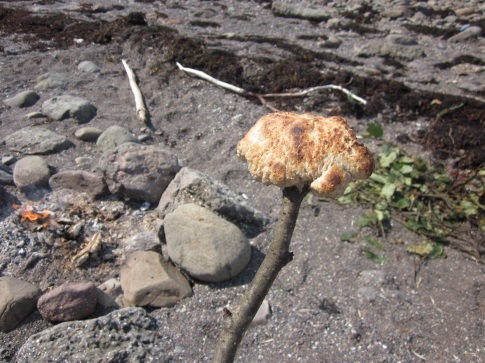 Bannock was generally cooked at home on a flat stone, placed in the open fire. Bannocks also played an important part in community life, being baked to celebrate traditional feasts, many of which had pre-Christian origins, such as the Bealtaine, Lammas or Samhain bannocks, baked for the start of spring, the harvest and the onset of winter, respectively. The ease of cooking oats up with water and heating them on a thin metal griddle or girdle over a fire was considered to be a military advantage for Scots armies.The troopers could carry their own bag of oats and cook up bannocks easily, allowing them to travel further, for longer, than their English counterparts dependent on bread. Let it lie half an hour, then take it up, and make your Manchetts, and let them stand almost an hour in the oven. Memorandum, that of every bushel of meal may be made five and twenty caste of bread, and every loaf to weigh a pound.